Add curb appeal and sophistication to your landscape with custom walkways, steps, retaining walls, water features and much more. Don't have a green thumb? Want to add curb appeal and pops of brilliant color? 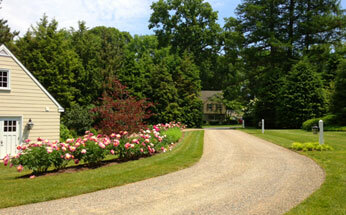 Let us bring out the natural beauty of your property with custom landscaping tailored to your style. Tired of weeding, pruning and planting every year? Need tree service? Save time and show off the stunning beauty of your property with regular landscape maintenance. Do you dream of a perfectly manicured lawn, lush trees or a stunning array of flowers and garden accents throughout your property? How about meandering walkways, elegant stone steps or serene water features? Would you love to redesign your landscape, but just aren't sure where to begin? Looking for tree service for a difficult tree on your property? Are you tired of handling all of your landscaping maintenance? Homeowners and businesses throughout Harrisburg, Mechanicsburg, York, Lancaster, West Chester and Reading, as well as those in Delaware and Chester counties turn to Advanced Landscapes to transform their landscapes into unique expressions of nature at its best! At Advanced Landscapes, our landscapers specialize in solving landscape challenges that others can't. Whether your residential or commercial property needs a complete makeover or just requires regular maintenance that you don't have time for, our landscapers offer the experience and attention to detail your property needs to bring out its stunning beauty. We even offer expert tree service for a variety of troublesome trees. With over 36 years of experience, our landscapers have completed a wide variety of residential and commercial projects in Dauphin, Lancaster, York, Delaware and Chester counties. Whether your home or commercial property is in Harrisburg, Mechanicsburg, Lancaster, Reading, West Chester or York, PA our landscapers are ready to help with all your landscaping needs! Contact Advanced Landscapes today for help with your next residential or commercial landscaping project!